#46. Landscape with Hiker and River. 26.5 x 42.5, oil on canvas on board. "Gilbert Munger" lower left. 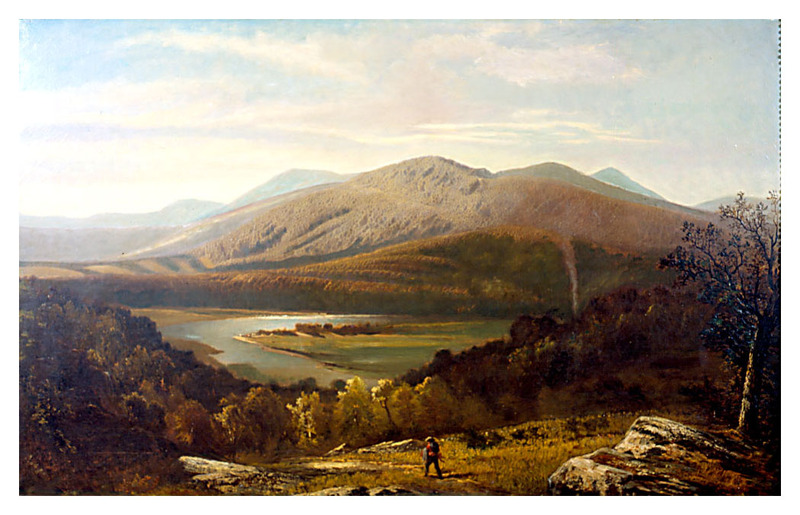 James P. Green of AppleEye Image, Callander Scotland, has identified this scene as the mountain Ben Levi viewed from the east near Callander, Scotland. 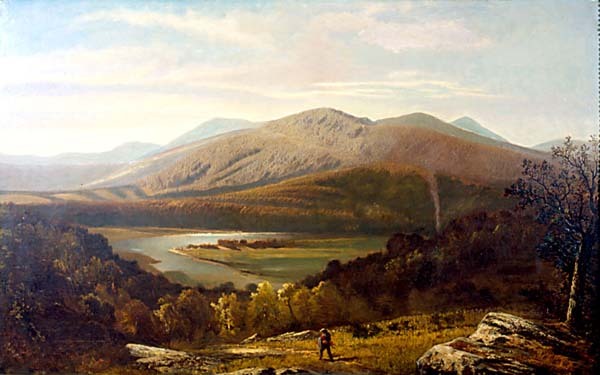 Munger painted in this part of Scotland for a few seasons starting in 1877. Purchased in England in 1970 by George B. Daniel of Chapel Hill NC (dealer). Sold at the Richard Bourne, Hyannis MA, auctions of 29 August 1970 for $300 and then 25 July 1972 for $650. Sold by Elizabeth R. Daniel (dealer) of Chapel Hill NC in October1992 to Robert Orcutt. Gift of the Orcutt family in memory of Robert S. Orcutt to the Tweed Museum of Art, Univ. of Minnesota Duluth, in 1996. IAP 612160502. QFD 44. See ads in The Magazine Antiques, May 1983 and March 1992. Image from author's transparency.